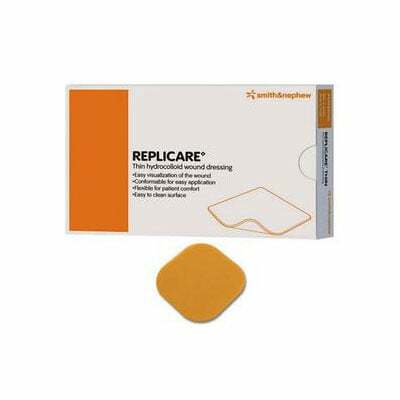 Smith and Nephew Replicare Hydrocolloid Dressing combines absorbency with all the advantages of a film dressing. This is 1.5" by 2.5" and sold by box of 30 each. This is a top quality wound care product by Smith and Nephew, Inc. ADW Diabetes has a wide range of these and other wound care supplies at great prices. 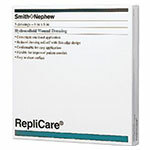 You are viewing the Smith and Nephew Replicare Hydrocolloid Wound Dressing. Replicare combines absorbency with all the advantages of a film dressing. A balance of adhersion and elasticity promotes excellent adherence over joints. Smith and Nephew, Inc. is a leading manufacturer of wound care supplies. Please review the size, style, and quantity carefully before ordering.